LONDON - Dare has promoted its managing director, Lee Wright, and its planning partner, John Owen, to run the agency as joint managing partners. Wright and Owen will take on the chief executive responsibilities currently held by the founding partner, Mark Collier, who will now focus on client relations, particularly with Barclays and Vodafone. Claire Hynes, a board account director, and Toby Horry, the joint head of planning, have replaced Wright as joint managing directors. Nick Emmel, the joint head of planning, has become the executive planning director. Brian Cooper, the creative director, has joined Dare's management board. Collier said: "John and Lee will form an outstanding double act. And it's great to be able to give wider management roles to the next generation of agency leaders in Claire, Toby and Nick." 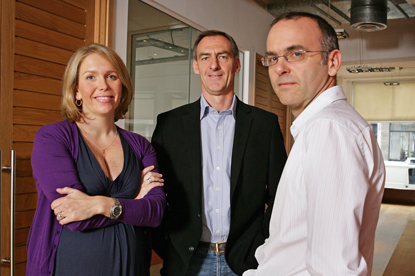 Wright and Owen have been briefed to look at the direction of the business, which was bought by Cossette Communications Group in 2007. It is awaiting higher bids for the company after turning down an offer from its former vice-chairman, Francois Duffar, and the former vice-president, Georges Morin. Dare's restructure follows a number of significant hires, including Mark Cramphorn, its director of operations who joined from TBWA in May, and Cooper, a former McCann Erickson creative director, who was appointed in June.